This is a rare and exquisitely made charm. However, there is no Chinese inscription and collectors are still uncertain as to its theme. The charm, which first appeared during the Liao (辽朝 907-1125) or Song (宋朝 960-1279) dynasties, is believed to depict huren playing musical instruments, dancing, and doing acrobatics (胡人乐舞杂伎). Hu (胡) means “beard” so the term huren (胡人) means “bearded people”. Huren referred to foreigners from north, west and central Asia who wore thick beards. In ancient times, the term huren translated as “barbarian” because the Chinese believed the huren were “uncivilized” in comparison to the Han Chinese (汉族) and their great culture. Nevertheless, these “barbarians” would eventually rule China during the Tartar dynasties. The Liao dynasty (907-1125) was ruled by the Qidan (Khitan 契丹族), the Jin dynasty (金朝 1115-1234) was ruled by the Nuzhen (Jurchen 女真族), and the Western Xia (Xi Xia 西夏 1032-1227) was ruled by the Tangut (西藏人). As seen at the left, the charm displays four individuals. Three are playing musical instruments while the fourth (bottom) is doing a handstand or similar acrobatic stunt. Even though the figures are referred to as huren in numismatic catalogs, none appear to have beards. The four figures are remarkably lively. They can easily be compared to the famous Eastern Han (东汉朝 25-220) tomb sculpture of a storyteller dancing and beating his drum. Huren were noted for their musical and dancing prowess. Poets at the time described their energetic dances as “barbarian leaps” (胡腾舞). At the left is a wall painting from a Tang dynasty (唐朝 618-907) tomb that was excavated in Loyang (洛阳), Henan province (河南省). 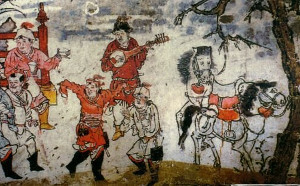 The painting depicts a similar scene of beardless huren from central Asia being proficient in music and dance. As can be seen in the detail at the left, the musician above the square hole of the charm is playing a string instrument. If you look closely, you can see that the instrument has four strings as confirmed by the four pegs near the end of the long neck. The four string instrument may be a ruan (阮). The ruan was named after Ruan Xian (阮咸) who lived during the Six Dynasties (220-289). The pipa (琵琶), or Chinese lute, evolved from this early string instrument. The ruan was held horizontally and played with a plectrum (pick) in a manner similar to today’s guitar. 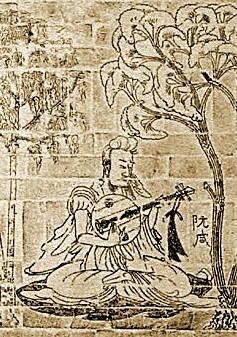 In the Tang and Song dynasties, however, musicians gradually began to hold the instrument vertically which is the way the pipa is played today. The musician at the left of the square hole is dancing and playing a flute (dizi 笛子). Flutes are among the world’s oldest musical instruments. Chinese archaeologists have discovered flutes dating back more than 9,000 years. A huren flutist can also be seen on this sculpture. A Ming dynasty (明朝 1368-1644) porcelain also displays a huren playing the flute. The figure to the right of the square hole is standing on his left leg. He is holding a stick in his right hand and striking an object in his left hand. He appears to be playing an ancient musical instrument known as a wooden fish (muyu 木鱼). The wooden fish was originally used in rituals by Confucians, Buddhists and Daoists. Over time, however, the common people began to use the wooden fish as a musical instrument. The figure at the bottom is performing a handstand or similar acrobatic stunt. To the left is another musical instrument, or possibly a Chinese yo-yo (kongzhu 空竹). Historical documents are unclear as to when the Chinese yo-yo, which evolved from the very ancient Chinese “gyro” (陀螺), actually appeared. 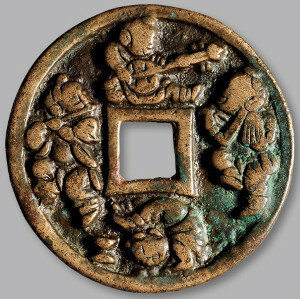 Some references mention the yo-yo appearing as early as the Three Kingdoms (三国 220-280) while others indicate a later date such as the Yuan (元朝 1271-1638) or Ming dynasties. The reverse side of the charm is usually described as showing four “babies” playing and having fun (婴孩嬉戏玩耍). 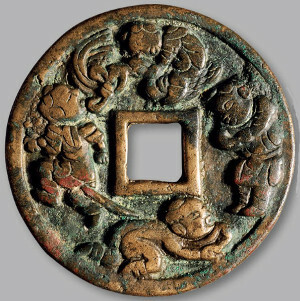 It is not unusual for Liao dynasty charms to include children playing. Also, the figure above the square hole is often shown riding a dragon. The dragon-riding figure is the “mother” known as Xi Wangmu (西王母), the “Queen Mother of the West“, as can be seen in this Liao dynasty charm. Regarding the charm shown here, however, the person at the top is not the Queen Mother of the West. The figure resembles the other “babies” but, nevertheless, does appear to be riding something. As mentioned above, this is a very rare charm. It sold at auction in 2011 for about $46,280 (RMB 287,500).